Guilford Plastic Surgery | Microneedling with Rejuvapen | Beth Collins, M.D. 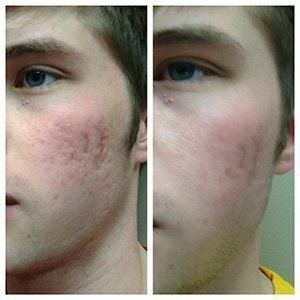 Get the results of 4 treatments of rejuvapen with one treatment with one of our new lasers! The Rejuvapen treatment is a micro-needling treatment that stimulates the production of collagen in the skin. This medical grade treatment not only will improve the skins appearance, but also can be used to treat hyper-pigmentation, stretch marks, acne scars and fine lines and wrinkles. There are many wonderful benefits that can result from the treatment. Since micro-needling enhances the production of collagen the treatment can reverse the signs of sun damage, improve the appearance of acne scars, stretch marks and hyper-pigmentation. Fine lines and wrinkles can be reduced and an overall healthier appearance of the skin will occur. Typically the healing time depends on the severity of the damaged skin and the depth of the procedure. Most commonly there may be some redness that resembles mild sunburn. This may last for 2-4 days. Some patients may have the redness dissipate within 24 hours. Rejuvapen is a treatment that can be used on all skin types and can be used to treat acne scars, stretch marks, fine lines and wrinkles. When will patients see results? Patients may notice healthier looking skin right away. However, keep in mind that dermal collagen remodeling occurs over time and it would not be realistic to expect damage that has happened to the skin over a long period of time to disappear right away. We suggest a series of 4-6 sessions depending on what the treatment is for. Individuals may not see final results until 3-6 months following the last appointment. Dr. Beth Collins is a board-certified plastic surgeon that routinely sees Connecticut patients from all over New Haven County including East Haven, West Haven, Madison, Branford and Guilford. If you are interested in the latest technology in skin micro-needling, please contact Beth Collins, MD to arrange a consultation. Get even more from your treatments when you enroll in VIP membership. This exclusive program gives you access to incredible savings. Rejuvapen is a medical grade, state of the art Micro Fractional Collagen Stimulation System™available through skincare professionals only. Rejuvapen is designed to stimulate your skin’s natural ability to produce new collagen formation creating healthier skin, and can be used to improve the appearance acne scars, hyperpigmentation, stretch marks, skin texture as well as, fine lines and wrinkles. The repair process of your skin is accelerated by Rejuvapen through the creation of microscopic channels, which also allow products to penetrate into the deeper layers of the skin resulting in better product outcomes. The concept of micro-needling has been around for a while and is based upon the skin’s ability to naturally repair itself when injured. Immediately following an injury, our skin begins the process of dissolving tissue damage and replacing it with new cells. Micro-needling allows for controlled stimulation of the skin’s self-repair process by creating precise, micro-injuries in the skin, which automatically trigger new collagen synthesis without causing scar tissue formation. The micro-injuries also create channels that allow product to penetrate deeper into the skin resulting in better product efficacy. There are numerous benefits received through use of Rejuvapen because new collagen production can reverse the effects of sun damage, improve the appearance of acne scars, stretch marks, and hyper-pigmentation as well as enhance the overall appearance of aging skin reducing appearance of fine lines & wrinkles. One of the most exciting things about Rejuvapen is that it can be used on all types of skin and can be used to address a wide range of problems such as acne scars, stretch marks, fine lines and wrinkles. Rejuvapen’s variable needle depth allows for versatility and therefore it can be used on many parts of the body, including the face, neck, décolleté, arms, hands, legs, abdomen and back. The unique design of Rejuvapen allows for individualized settings, which makes the treatment very comfortable for most patients. The procedure typically takes 30 minutes depending on the size of the area treated, number of areas and the severity of damage on the skin. The total healing time depends on the severity of the damaged skin and the depth of repair process required. On average, patients have some slight redness/pinkness (like a mild sunburn) for 2-4 days. Some patients may heal completely in 24 hours. Many patients notice healthier looking skin immediately. However, the natural repair process of your own skin continues to progress over the course of several weeks. Keep in mind dermal collagen remodeling takes place over time it is not realistic to expect damage that has occurred over an extensive period of time to disappear immediately. You may not see the final result until up to 3-6 months following your final session. The number of treatments required will be determined by each individuals treatment goals and the health of your skin. However, it is recommended for most patients to receive a series of 4 treatments spaced about 4 weeks apart. For patients with deep wrinkles, advanced photo-aging, stretch marks or acne scars it is recommended to receive 6-8 sessions at 4-6 week intervals. We also recommend developing a maintenance plan to help maintain the glow and rejuvenating effects of your personalized Rejuvapen treatments. What are common reactions following the first treatment? Most patients only experience some slight redness/pinkness (like a mild sunburn) for 2-4 days. However, the reaction to treatment depends on the severity of the damaged skin, the depth of repair process required, and how aggressive the treatment is performed. Can I get a Rejuvapen treatment if I’m pregnant? Rejuvapen is not recommended for pregnant women because the micro-needles produce micro-injuries on the skin, which naturally causes a repair process to begin. This healing process and production of new collagen requires vitamins and nutrients to be utilized that would otherwise be reserved for the unborn child. Can Rejuvapen be used on all Fitzpatrick skin types? Yes! In fact, this is a big advantage offered through Rejuvapen’s technology. Rejuvapen treatments can be performed on all skin colors and types. Is there anyone who should not use Rejuvapen? Use of Rejuvapen is contraindicated for patients with: A history of keloid scars, scleroderma, collagen vascular diseases or cardiac abnormalities; a hemorrhagic disorder or hemostatic dysfunction; or an active bacterial or fungal infection. Typically, patients can resume their normal makeup and skin care regimen 2-3 days following their Rejuvapen treatment. Some post procedure make-up can be used immediately post treatment. Oxygenetix is safe to use. As this may vary based on the area and type of treatment performed, make sure to consult your Rejuvapen provider for their recommendation.